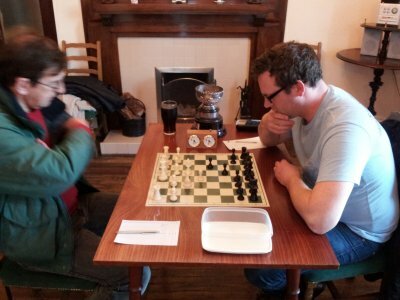 Scarborough Chess Club - Venue and meeting details. Scarborough Chess Club currently plays at the North Riding Hotel in North Marine Road, Scarborough. Club nights are every Tuesday from 7:30pm to 10:30pm. There are a variety of tournaments organised including a Club Championship which runs throughout the year, two handicap tournaments, as well as informal friendly games played on club nights. There are a wide range of playing strengths in the club. The first Tuesday of each month is set aside for training and discussion. These sessions are expected to last about an hour with the remainder of the evening available for informal games or the club's quickplay handicap tournaments. All are welcome. The club enters two teams in the York League. Details of results, league tables and fixtures are available through the English Chess Federation website. The deciding game in the 2014 club championship. For more information, contact Neil Pennock - npennock@btopenworld.com. New members of all playing strengths are welcome. Scarborough Chess Club would like to thank the North Riding Hotel for providing the club with a venue. Web design and hosting by Chestysoft. Last update: 10th January 2019.